I know what you’re thinking: He loves middle-class German peasants? I can see how you’d be confused, but no. I have nothing against said peasants, but I actually love those succulent meat patties that I get to grill to perfection with a spatula in one hand and a brew in the other. As I covered in a previous post, I hate the word “instead”. I have not replaced beef with turkey here. Some wily beef-thief has not pilfered my meat whilst slipping a pound and a quarter of lean turkey on to the counter in its place. I am not cooking turkey burgers INSTEAD of beef burgers. I’m just cooking turkey burgers. Actually, I have previously made the mistake of cooking turkey INSTEAD of beef, and I ended up with four dried-out, flavorless, purple-gray hockey pucks. It was not a pretty sight, but it taught me something, and that is that turkey does not have the natural (and flavorful) fat of beef, and there for can not be used as a direct substitute. It just doesn’t work. That flavor must be found elsewhere. That’s actually one of the reasons that I like cooking with turkey. Unlike beef burgers, which are delicious with nothing more than a little seasoning, turkey begs the insertion of multiple ingredients, which can lead to some interesting combinations and flavors. 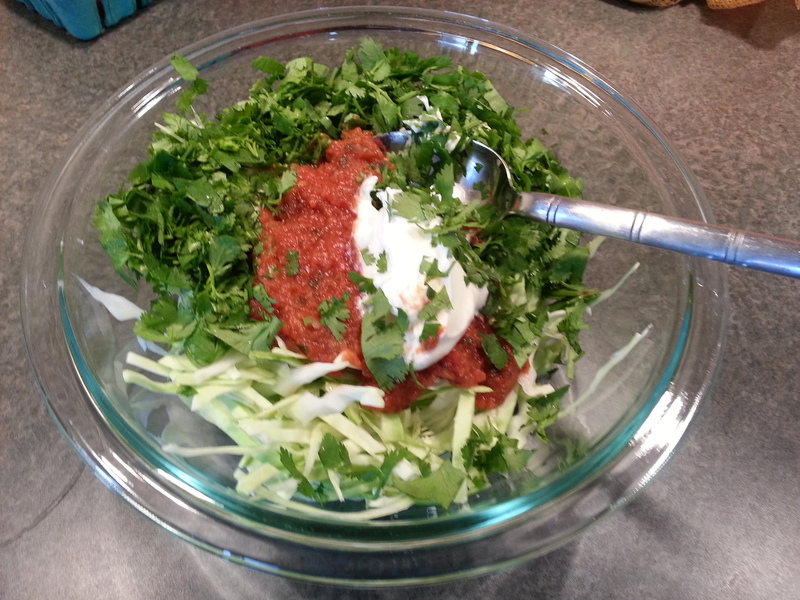 the following recipe is one of my favorites. Preheat the grill, and oil the grates to prevent sticking. 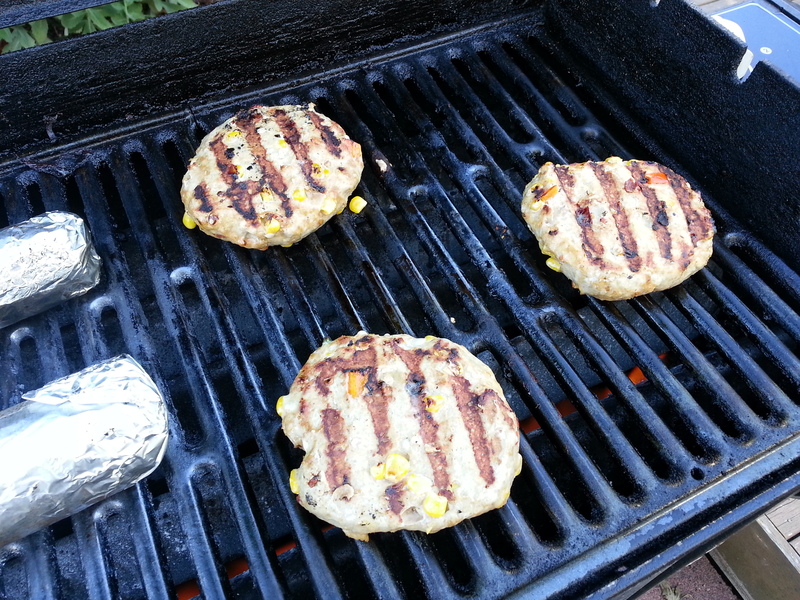 Grill the burger patties on medium-high heat for 3.5 to 4 minute per side to get some nice grill-marks on them. Reduce the heat to medium, and grill for an additional 2-3 minutes per side, for a total grilling time of no more than 12-14 minutes. Add cheese (if you so desire) after the final flip. Toast the buns for a minute or two, and remove from heat. 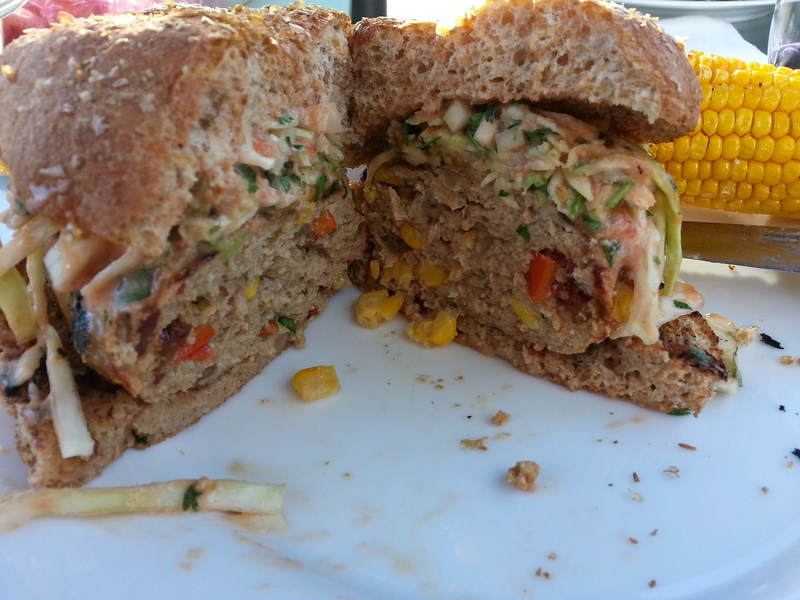 Serve the patties with a generous topping of salsa slaw, and enjoy!